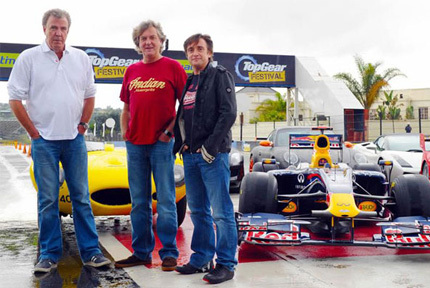 Top Gear presenter Jeremy Clarkson clearly has a thing for Durban. “God, I love being in Durban,” he tweeted to his 1.9 million followers on the weekend during the Top Gear Festival. This tweet wasn’t a once off either, after arriving at the Moses Mabhida Stadium on Thursday night, Clarkson tweeted again, “The greatest stadium in the world, and our home for the next five days.” By 4pm on Monday, his tweet had been re-tweeted 924 times. Sithole claims that Clarkson himself is a brand and that most of the international tourists who came to the city were from the UK. “Jeremy has a lot of followers, so being promoted through people like him helps Durban access and cement that market,” he said. The Top Gear Stadium Show, which was the highlight of the event, saw Jeremy, James and Richard entertain the Durban masses with the clownish antics that they are known and loved for. The trio drifted into the stadium on a moving stage, which was quite fittingly powered by a V8 engine and they gave it a good rev just to prove that! The trio together with the Stig treated the crowds to a few theatrical races, including a three-wheel dice in which they spent most of their time on their sides. The RB7 smoked up the stage and there was some eye-popping stunt biking action and a motorcycle polo match.